1823. Patent means of propelling railway carriages. 1796 March 18th. Baptised at Henley the son of William James and his wife Dinah. 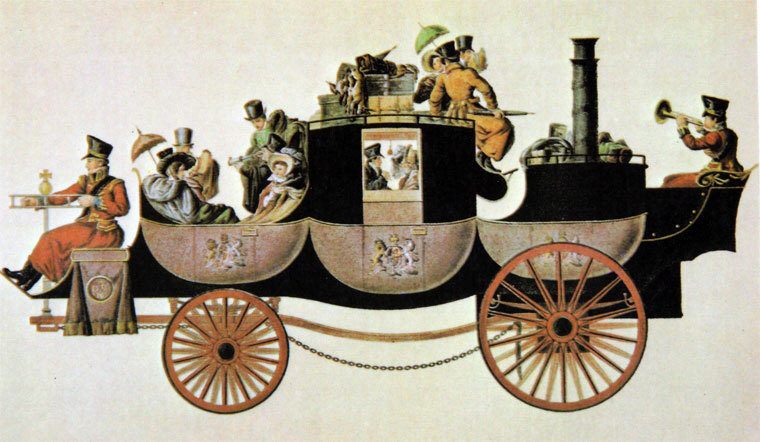 1824/5 W. H. James constructed a steam drag (an engine for pulling a coach on a roadway) which was powered by two separate small two-cylinder engines. c1829 He built a coach seating 15 and weighing 3 tons with two boilers running at the high-pressure of 250 psi. He set up an independent business as an engineer in Birmingham, where he produced experimental steam-driven road vehicles. He took out patents for locomotives, steam engines, boilers, railway carriages, and diving apparatus and invented a multi-tubular boiler for steam engines, in which the tubes were filled with water. 1829 W. H. James constructed a car-automobile, that travelled at a speed of 2.5 kilometres per hour, transporting passengers. He took part with his father in the survey of the Liverpool and Manchester Railway. 1832 He built a coach driven by a four-cylinder engine, each paired off so that a pair drove one of the driving wheels independently. It had a three speed variable gear and a sprung rear axle. W. H. James recognized the need for flexibility in a self-propelled vehicle and introduced a rudimentary three-speed transmission. 1832. Patent. To W. H. James, of Thavies Inn, London, engineer, for improvements in the construction of steam-carriages. 1845 'The Mechanics' Magazine, of Saturday last, has a notice of a new plan, invented by Mr. W. H. James, for the rapid transmission of letters and light dispatches through tubular passages, at certain intervals in which he proposes to place air-exhausting machines, which will establish a perpetual current or artificial hurricane, by means of which spherically-shaped elastic vehicles, or bags, will be blown at inconceivable speed from station to station. The first cost is estimated by Mr. James at £2,000 per mile, and the working expenses at from £300 to £500 per annum for every fifty miles. This system would enable us to transmit documentary intelligence at the rate of 7,200 miles a day.' Mr. W. H. James, the son of the eminent person of the same name, who has so prominently identified himself with the railway system. Went to live in the USA. 1861 Living at 8 St Mary St., Old Kent Road, Peckham: William H. James (age 65 born Henley in Arden), a Civil Engineer (Retired). With his wife Mary Ann James (age 54 born Bath). Also his widowed sister Susannah Kiablan(?) (age 60 born London). 1871 Living at 5 Dulwich College: William H. James (age 75 born Henley in Arden, Warwickshire), a Civil Engineer. With an adopted son William H. J. Mings (age 8 born Peckham). 1873 December 16th. Died in the Dulwich College almshouses. William James' eldest son, WILLIAM HENRY JAMES (1796-1873), born at Henley-in-Arden in March 1796, assisted his father in his survey of the Liverpool and Manchester railway. He subsequently commenced business as an engineer in Birmingham, where he made experiments upon steam locomotion on common roads. He took out patents for locomotives, steam-engines, boilers, railway carriages, diving apparatus, &c., and he is commonly stated to have anticipated Stephenson in the application of the tubular boiler to locomotives, but this is an error, James's boiler being what is known as a 'water-tube' boiler. He died 16 Dec. 1873 in the Dulwich College Almshouses. 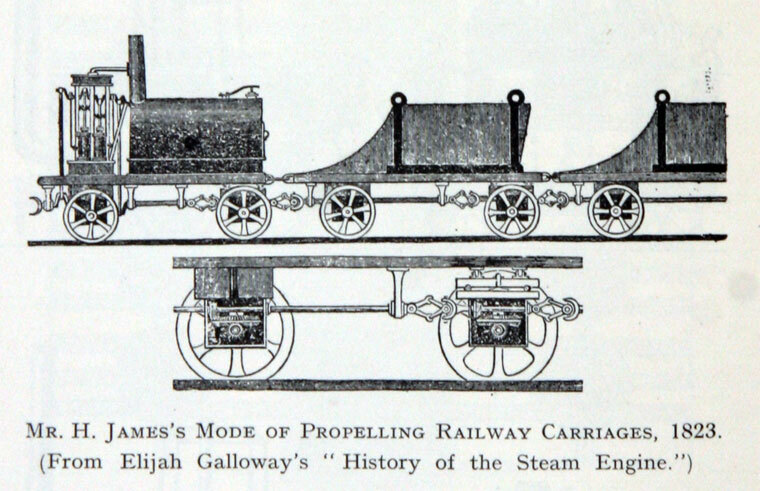 History and Progress of the Steam Engine: With a Practical Investigation of ... By Elijah Galloway, Luke Hebert. This page was last edited on 18 February 2017, at 21:54.